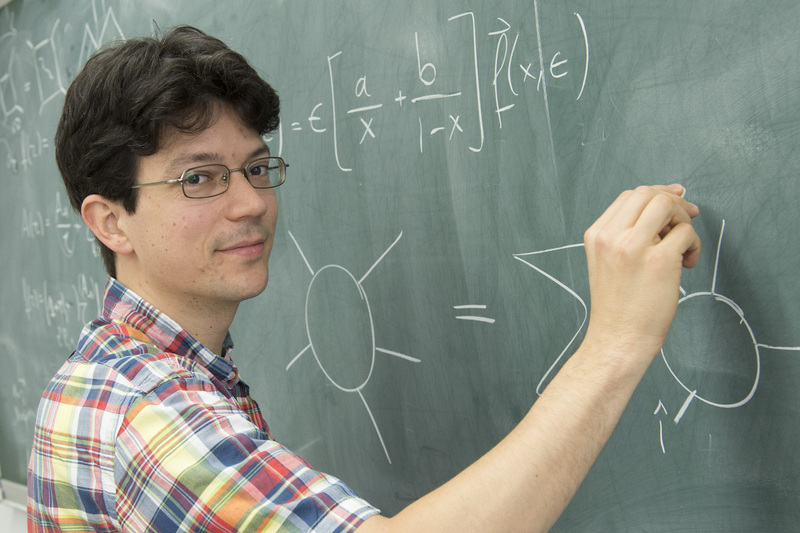 Johannes Henn, Professor of Mathematical Physics at Johannes Gutenberg University Mainz (JGU), is to receive one of the most richly endowed grants by the European Research Council to develop new methods of calculation in the field of theoretical physics. In June 2015, Henn came to Mainz University from the Institute for Advanced Study (IAS) in Princeton, New Jersey, USA. He is one of the leading theorists in the field of scattering amplitudes, which are used to describe experiments at particle accelerators. Henn pursues an innovative approach based on a better understanding of the analytical properties of scattering amplitudes. The European Research Council (ERC) will be providing an ERC Consolidator Grant worth some EUR 2 million to fund his project over the next five years. Johannes Henn, born in Munich in 1980, started his academic career in France. In 2005, he graduated from the École normale supérieure de Lyon. He completed his doctoral dissertation on the subject of theoretical particle physics at the Laboratoire d'Annecy-Le-Vieux de Physique Théorique in 2008. After an initial period of research as a post-doc at Humboldt-Universität zu Berlin from 2008 to 2011, Henn worked at the Institute for Advanced Study in Princeton until his appointment to Mainz University. The IAS, where Albert Einstein once worked, is a world leader in the field of theoretical physics. "Because it is exclusively dedicated to research, the IAS was the perfect environment in which to develop completely new intellectual approaches thanks to the opportunity for discussions with colleagues and sufficient time for undisturbed deliberation," emphasized Henn. This groundwork is the foundation on which his future research work funded through the ERC grant will be based. In his research, Henn focuses on quantum field theory. The concept was developed during the second half of the 20th century and describes the interactions between elementary particles. So-called Feynman diagrams have become the established method of graphically representing these interactions. In his ERC project, Professor Johannes Henn plans to develop new methods within quantum field theory for making predictions for experiments, such as those currently under way at the Large Hadron Collider (LHC) at CERN. Of particular interest in this regard is the study of properties of the Higgs boson that was discovered in 2012 at CERN. New theoretical calculations are required to match the experimental accuracy, especially in view of planned upgrades and new experiments at even higher energy levels. Traditional calculation methods often reach their limits in this area. Henn's work will therefore initially focus on the mathematical structure of theoretical models and their simplification. This should enable scientists to apply the corresponding theoretical aspects to experiments. His main concern is to better understand fundamental structures and find efficient methods of calculating scattering processes. Scattering processes occur when particles collide in accelerators such as the LHC. They are described by way of so-called scattering amplitudes in the framework of quantum field theory. “One often finds that a complicated calculation stretching over many pages produces a surprisingly simple result. This is a strong hint that there is a better, simpler way of arriving at these results. It motivates the search for new principles that simplify these and future calculations," explained Henn. One of his outstanding successes so far has been the development of a new technique for calculating Feynman integrals that is now in widespread use. "If you are looking for unexpected, simple structures, you will often find them in quantum field theory," said the physicist, adding that the area of research has developed very dynamically over the past ten years and continually produces new discoveries. Since his appointment to Mainz, Henn has established a work group whose research will now also be supported through the ERC grant. The results will ultimately contribute towards measuring the fundamental parameters of nature, such as the interactions of the Higgs boson, with even greater precision. Furthermore, the research work is expected to produce results that will contribute significantly to the discovery of completely new particles. The work of Henn's theoretical research team is part of the Precision Physics, Fundamental Interactions and Structure of Matter (PRISMA) Cluster of Excellence at Johannes Gutenberg University Mainz, which receives funding through the Excellence Initiative of the German federal and state governments. The ERC Consolidator Grant is one of the most richly endowed funding awards given by the EU to individual researchers. The European Research Council uses these grants to support excellent researchers at the start of their independent careers, in other words, usually at a time 7 to 12 years after they have finished their doctorates when they are developing their own research programs. Johannes Henn is one of the youngest researchers to be honored by this personal distinction. In order to be awarded a grant, applicants must not only demonstrate excellence in research but must also provide evidence of the pioneering nature of their project and its feasibility.